"After WWII, France sought to reestablish its colonial empire in Africa and Asia. Indochina had been taken over by the Japanese in 1940. When they left, there was a long war between the local peoples and the French and a few local allies. In what became North Vietnam the French dug in. Marshal Jean de Lattre de Tassigny arrived in 1949 to take over the colonial forces. He created the de Lattre Line as shown above. This was to protect the capital, Hanoi and its connections to the main seaport at Haiphong…." Although it did help free up mobile formations so they could hunt the Viet Minh. The French were lucky De Lattre came along when he did. That is true … but in the end … the French could not control or suppress "the home team" … in the long run. 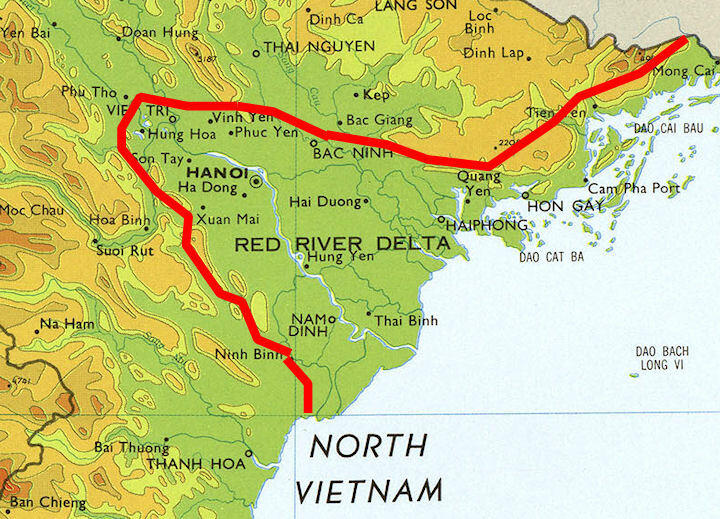 The line showed it's worth when the Viet Minh launched large scale attacks in 1951. I'm sure the line was helpful when the CEFEO started to secretly evacuate the Delta in 1954 as well. Would France have been able to even nominally control the area around Hanoi, from 1950-54, without De Lattre's fortifications? Good question … probably not … But again, in the long run, well we know how that worked out. Dien Bien Phu, ironically, was the final cage match. If the Viet Minh had been defeated, it would have put the French in a much more favorable position than the one they ended up with. Very true … but as we all have studied DBP, it seems the French were going to lose inevitably. Building base camps all be them fortified in a valley surrounded by high ridges, etc. And basing almost all their resupply by air. Seems like a poor plan at least in hindsight, so it appears. Well, DPB's plan made sense IF (and it was a big if) the French could have supplied the position successfully. They were thinking Na San and that really led to their downfall. Also, the lack of unanimity at the high command level didn't help. Despite the disaster, Vietminh losses were severe and the French were still getting deserters in early May. So it remains a what if. Wouldn't have been the first time a force did better than its high command. Very true … And interestingly some aircraft dropping supplies were US and piloted by US crewmen to DBP. Plus like many Asian Communist forces, i.e. the Vietminh later NLF/VC and NVA, e.g. PRC in the ROK, high losses is a "hallmark". Of course in many cases they had the population to do. As the PRC, they made and make up 20% of the planet. Joe Galloway who was a reporter with the 7th Cav at LZ X-Ray. And wrote the book, "We Were Soldiers Once, And Young". I saw him on a interview years later and said, "The US was trying to fight a war of attrition against the birth rate of a 3d World Asian country." His words not mine, but those comments seem to be a valid. It is estimated the VC and NVA suffered over 1 million dead. But that is only an estimate, however, with all the firepower the US wielded … it may be true. Or very close …? Good points…part of the issue with the later war was the US never really seems to have decided (1) what it was trying to accomplish or (2) how to do it. By the time they really started to figure it out in 1969, it was too late--public was exhausted (and wrong guy had been running MACV for too long before Abrams showed up). And the air war--Linebacker showed what we could do but we stayed committed to the disaster of Rolling Thunder from 65-68 and accomplished little. The French had an even worse problem, in that their air assets were wholly insufficient to their goals. Martin Windrow's _The Last Valley_ has some great chapters on that. Yes I agree … Seems the US military forgot or because of political interference, could Not use some of the basic Principles of War. Mass and Objective come to mind off the top of my head. Realizing this started out as an insurgency, with the locals having the home court advantage, and strong support from outside players. Then the NVA, like the PRC in the Korean War, came in to help the VC. Which became critical in both wars. However, the South had very poor leadership and in many cases the ARVN, etc. didn't have motivation many of the VC and NVA did. However turning Hanoi and much of the North's infrastructure into the dark side of the moon. May have put the situation in a better place for a "peace deal" than we saw. And the South may not have been so easy to defeat/overrun. But again Hindsight is 20/20.